An app is a term used to describe pieces of software that use Facebook data, even when those applications weren’t built by Facebook. You may use apps as games, websites, and useful tools, all of which make use of the data you already share on Facebook. To make it easier to get people using these applications, they import the data from Facebook. For now, keep in mind that the apps you see on this page are those you chose to interact with. You won’t see random applications appear here without you giving them some permissions first. This section is where you go to edit how apps, games, and websites interact with your Timeline. The Apps You Use section shows all the apps you’ve used, in the order of those used most recently. Apps require direct permission from you to begin accessing your data and posting to your Timeline. Next to each app is the audience that can see that app on your Timeline. Across from each app is an Edit link, which reveals a menu of settings about that particular app. 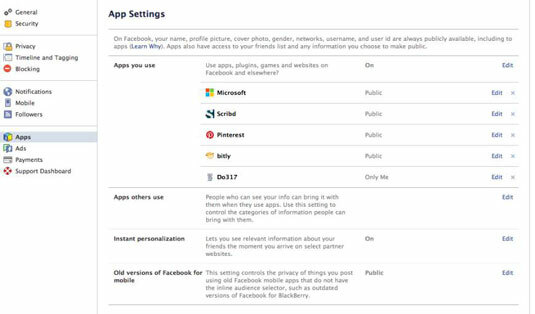 Just above the list of apps is a small setting that asks whether you want to Use Apps, Plugins, Games, and websites on Facebook and Elsewhere. By default, this setting is On. If you don’t want to use any applications ever, you can turn it off. Consider carefully whether you’d like to turn it off, personally, because apps can be fun and useful, both on Facebook and across the web. There are several sections of information about each app. Some of these sections have options you can change, and others are merely informative. Last Logged In: This lists the last time you logged into the app and used it. Visibility of App: The Privacy menu here has the same options as any other Privacy menu. You can choose who can see your activity within an app. This App Needs: This list of information shows you what Timeline information the app requires. For example, the Fandango app requires your likes and your friends’ likes. It probably uses this information to recommend movies you might like. If you ever see a piece of information on this list that doesn’t make sense, the app may not be reputable. You could then choose to remove or block the app. This App Can Also: This section might not be present for all apps. This reflects any special permissions you may have granted to an app. 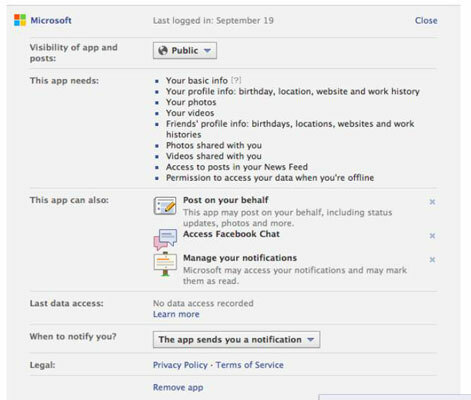 Special permissions are things like access to Facebook Chat or adding posts on your behalf. You can remove a permission by clicking the x next to it in this section. Certain permissions are required by apps if you want to use them. That means you can’t take the permission away unless you choose to remove the app entirely. Last Data Access: This shows the last piece of information the app accessed about you and when it accessed that info. When to Notify You? Apps may send you notifications about activity your friends have taken or other info you might want to know about. You can choose to let applications send you notifications whenever it wants, or never. Remove App: At the very bottom of this information section is a link you can click to remove an app. Removing an app revokes the permissions you have given it in the past and means it won’t be able to access any of your private information going forward. Even if you don’t use applications, your friends may. Similar to the way that you may not add photos to Facebook but your friends may add and tag photos of you, your friends may also pass on information about you to applications. You can restrict what applications can see by using the check boxes. Instant Personalization is a Facebook feature that basically lets certain Facebook partners access your public Facebook information using browser information, as opposed to using the permission dialog boxes that most apps use before they get access to any information. These partners are websites like Bing, Yelp, and Pandora. You can turn off Instant Personalization by clicking Edit on the right side of the page and deselecting the Enable Instant Personalization on Partner websites check box. You may be presented with a pop-up window with a video first. You can watch the video or just close the window to continue on to change your setting. If you are certain you’re using the most recent Facebook app, this setting doesn’t apply to you. If you’re using a version of Facebook for Mobile that doesn’t allow you to change your privacy for each post, you can use this setting to control who sees posts made from your phone. Click Edit on the right side of the page and use the Privacy menu to make your selection.